Mods from Hawg are very popular today. 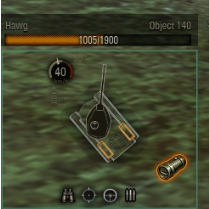 Recently we introduce Hawg’s Damage Indicator. 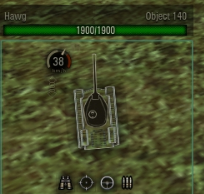 But today here is one more mod from this author – Hawg’s glass damage panel for WOT 1.4.0. The damage panel displays all the important and necessary information for the player on the screen. Who shot, where the shot was made, the type of projectile, the time of reloading and much more. But sometimes all this information instead of helping the player – it just hinders him. Many panels take up a large amount of space on the screen and thus distract the player from the battle. But Hawg’s glass damage panel cardinally differs from others. This panel is transparent. It looks like a glass so player have more vision of the battle field.